Small - £32.99 Medium - £24.99 Large - £32.99 X-Large - £40.99 Only 7 left! Briarcliff Manor houses some of the most notorious nutcases/criminals in the state of Massachusetts. The homicidal maniac, Bloody Face, was just admitted and there's no need to disclose how he earned that lovely nickname; it's pretty self-explanatory. Dr. Arden is busy down in the basement turning his patients into monstrosities then sending them down the "death chute" and Sister Mary Eunice, well Sister Mary Eunice is the devil. Literally. She's possessed by a demon and now rejoices in performing unnecessary lobotomies. 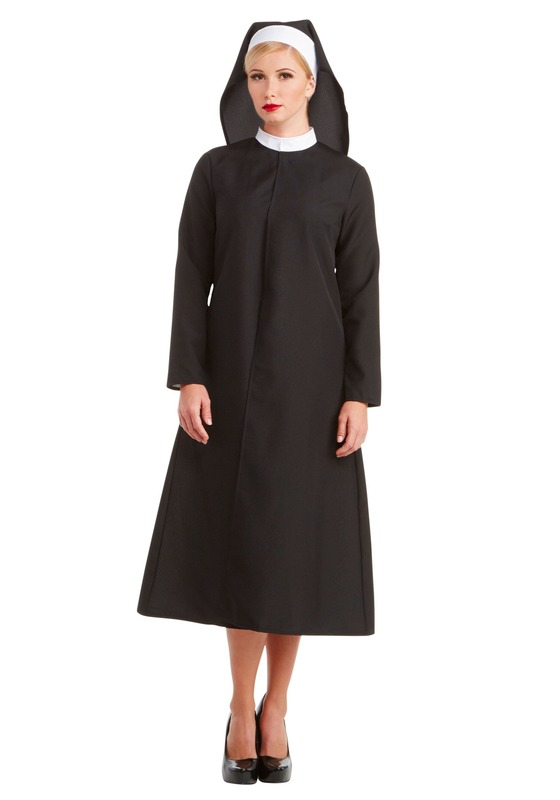 This isn't your typical nun costume. Although you'll receive a traditional veil and matching robe, you'll also get a flaming red negligee. Keep the robe fastened together, concealing the sultry nightgown underneath. We like how this costume reflects Sister Jude's personality; strictly business on the outside with a tempestuous interior. Bring your wild-child demeanor to this AHS costume and people will think you're the real deal. If you really want to do some damage this Halloween, then team up with other nefarious characters from the show. Do a season crossover and get together with Twisty or the Countess to create a terrorizing trio. Create a horrifying (yet crowd-pleasing) couple's costume by gifting your date with a Bloody Face mask. You two will definitely be the most monstrous couple at any party, even if that party is being held at Briarcliff.